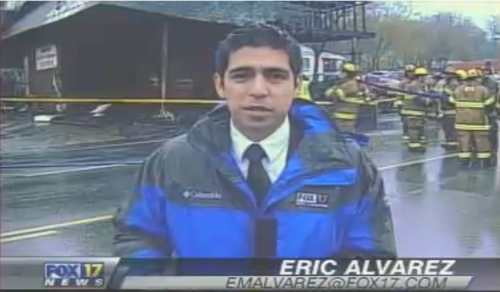 Eric Alvarez (Twitter: @WZTVEricAlvarez) is a reporter for the Fox 17 news team. The station says that "you can see Eric around town bringing you the latest from the Grand Ole Opry, fan reactions outside Titans and Predator games and the stories that most affect the underrepresented communities of this great city." Alvarez had previously worked for various Spanish-language media outlets in Nashville, starting in 2008 with the local Telefutura affiliate, where he was General Manager. Prior to Telefutura, Alvarez was a producer on the Peabody-award winning investigative team at KNBC in Los Angeles. Alvarez earned his Master's degree in broadcast journalism from the University of Southern California and did his undergraduate studies at Vanderbilt. My parents and older sister first came to Denton, TX in the early 80s. My father earned a grant from the Mexican government to study at the University of North Texas (then North Texas State, I think) and came with a student visa. I was born in Denton in 1983, the first person in my extended family born in the U.S. Shortly after, my father earned a PhD in Biochemistry and Molecular Biology. My family has lived in the States since 1981, except for two years spent in Zurich, Switzerland in 1985 and 1986. I learned Spanish and English simultaneously as a child. We spoke Spanish exclusively at home and English exclusively when we were out of the house. I learned French in school and on the streets of Aix-en-Provence. I was lucky to be able spend a semester abroad during my junior year at Vanderbilt. It was a once-in-a-lifetime opportunity and my months in the south of France allowed me to view society, sports, politics and culture from another angle. I am extremely proud to be able to use my knowledge of foreign languages to fairly and more accurately report the stories of Nashville's diverse community. This profile of Eric Alvarez is the fifth in a series of media profiles here on HispanicNashville.com. Recently featured media profiles include Chris Echegaray of the Tennessean, Charles Maldonado of the City Paper and Scene, Marielena Ramos of NewsChannel 5 Plus, and Amy Napier-Viteri of WKRN/News2. On deck are Christine Maddela of WKRN/News2, Ray Ponce de Leon of The Contributor, and Jaci Velasquez of 94FM The Fish.